The government of St. Helena has recently begun issuing silver bullion coins with legal tender value. 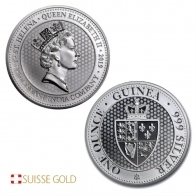 Silver St. Helena Guinea coins are available in current and backyear versions, in 1 ounce size only. The coins are backed by the government of St. Helena. Coins may be purchased individually or in monster boxes of 400 coins. VAT-exempt Swiss storage is also available.